Steve and I had our first encounter with iPad-deprived travel on our return from this past trip, which required us first to fly from Entebbe (Uganda) to Dubai, and then from Dubai to Los Angeles. Dubai International Airport was on the first list of those that the US government targeted for restricting electronic devices in the passenger compartment (along with Amman, Jordan; Cairo; Istanbul; Jidda and Riyadh in Saudi Arabia; Kuwait City; Casablanca in Morocco; Doha in Qatar; and Abu Dhabi in the United Arab Emirates). This week there’s been talk that the ban is likely to be extended to flights from Europe to America. Maybe folks who use their laptops and tablets for entertainment don’t find all this too burdensome; the big jets typically offer so much in the way of movie and game choices these days. But Steve and I both typically spend a lot of air time writing, so to us it threatened to be a disaster. Happily, we found a way around it. Although we always take only carry-on luggage, Emirates restricts the allowable weight to only 7 kilograms (a bit more than 15 pounds), so we were told in Entebbe that we had to check our suitcases through to LAX (even though we had a 10-hour layover in Dubai and were sleeping in a hotel near the airport.) We insisted that we needed our iPads on the flight to Dubai, however, and the agent assured us there’d be a way to check them by themselves on the flight from Dubai to the US. This enabled me to write my final blog post (about our experience in Uganda) on that flight. So I was happy. At the Dubai airport on Tuesday morning, we waltzed through security with our iPads, but at the gate, we had to queue up to have our hand luggage inspected by guards who looked for the taboo electronic gear. We weren’t surprised that they told us we had to take our iPads and Steve’s camera to another table staffed by Emirates employees who filled out forms and carefully packed our gadgets in bubble wrap and put them into cardboard boxes. What they did NOT impound, however, was the separate Apple keyboard that I had schlepped along for the whole trip. It can be synched (via Bluetooth) with Apple devices — including the iPhone. So that’s how Steve rigged up a writing system. Using the Notes app on his phone, he spent at least 10 of the 15.5 hours of the flight typing up all his thoughts and notes about our visit with the granny groups. He periodically backed up his work by Airdropping the file to my iPhone. We both had to admit that Emirates was remarkably efficient about getting the devices back to us in LA. No more than 15 minutes after we reached the baggage claim area, there all the checked electronics were, our box among them. We’re still wondering if it’s really true that anyone can pack a bomb into an iPad that continues to be operational. And we wonder why a bomb in the luggage hold of an Airbus 380 would be less disastrous than one in the passenger compartment. But what do we know? In planning and anticipating this trip, I had envisioned that our first two weeks (in Arabia) would be the fun part. 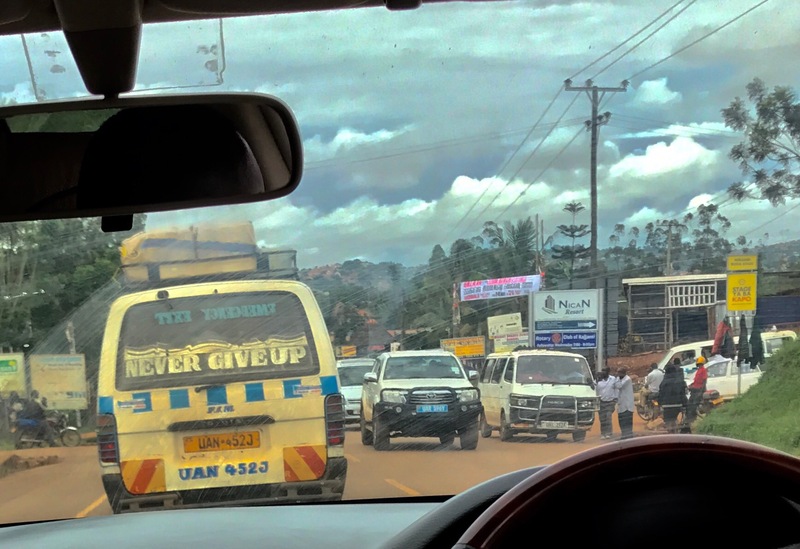 In Uganda, I expected something more challenging and not always pleasant: two 8- to 10-hour driving days (between Kampala, the capital, and the remote western region where the granny project is located) sandwiched around three intense days of traveling over punishing dirt roads to get to hours of meetings in poor villages. But as we were packing Saturday night for our return trip home, I reflected with some surprise that the Ugandan part turned out to be the best. As much as I love travel, I’m often struck by how superficial it can be. You blow through a city or a country in a day or two, and even if you’re paying close attention and asking tons of questions, you leave with only the slimmest understanding of how things work. Our sojourn in Uganda was an effort to go a bit deeper. We were returning to Nyaka, the village we visited four years ago as emissaries of Women’s Empowerment (WE) in San Diego. 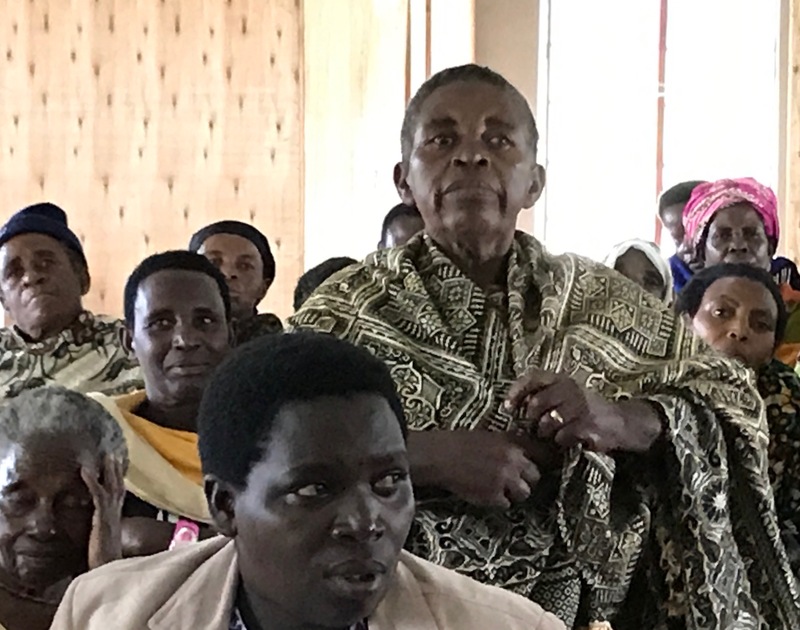 At that time, we were seeking to determine if the Nyaka AIDS Foundation’s granny project might be a good partner to receive some of the money WE raises for micro loans. Steve and I fell in love with the Ugandan grannies the first time we were greeted by a group of them dancing to salute our arrival. These ladies range from 50 to 100 years old and face challenges we found almost unimaginable. Many have lost their husbands, yet all are raising grandchildren who’ve been orphaned or abandoned by their parents. They often look somber and stoic, but when they break into dance, they display astounding energy. Dancing transforms them; turns them exuberant, even joyous. Four years ago, in talks with the Ugandans who run the project and visits with three granny groups, we also were impressed by their fledgling micro loan program. Upon our return to San Diego in June of 2013, the WE board approved a partnership; Steve and I since then have served as the liaisons between the Ugandans and the Americans. From informal emails and regular reports from the Ugandans, we’ve learned a bit more about them over the years. But we’ve also come to realize the many limits on our knowledge. If you’d asked me a month ago how a 75-year-old widow with no retirement income could not only survive but also raise young children, I would have had no idea. Thanks to the time we spent in Kigezi, I glimpsed how at least a few of these ladies do it. One afternoon, we visited the home of 64-year-old Paulina. She’s raising 4 grandchildren ranging in age from 7 to 14. Her most recent loan was for 300,000 Ugandan shillings (about $82), and she used part of the money to buy two piglets, paying about $11 each for them. If she can keep them for about a year, until they weigh 45 to 55 pounds, she figures each should fetch somewhere between $55 and $70. Paulina also was using part of her loan to buy ripe coffee beans from neighbors. She dries the beans and sells them to a local coffee mill. 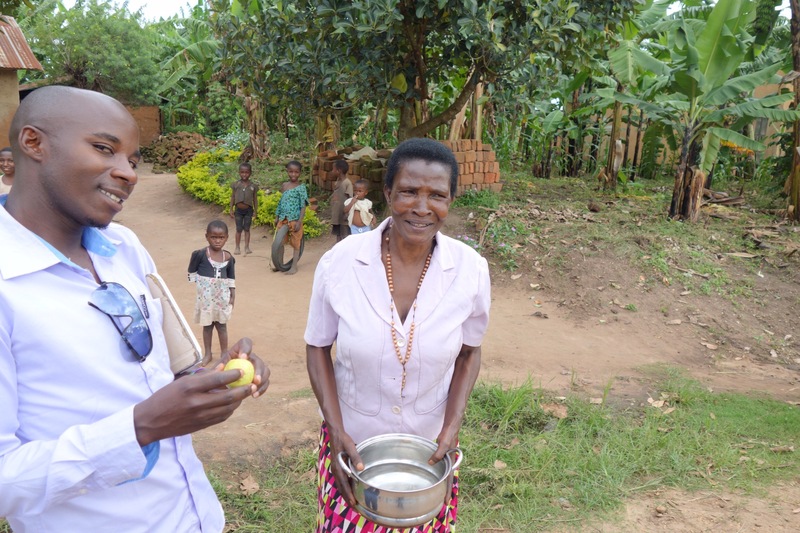 Like most older women in rural Uganda, she doesn’t have to worry about paying for housing. She lives in a humble dwelling, with no electricity or water, but it’s been in her family for a long time. She also raises a variety of crops; it’s a way of life here. If the people are poor in this part of Uganda, the land is rich, enabling folks to grow corn, beans, peanuts, sweet and “Irish” potatoes, millet, cassava, rice, yams, vegetables, sorghum, tomatoes, and a head-spinning variety of bananas. Despite the hardships she’d endured, Paulina seemed hard-working and organized. Fifty-six-year-old Jolly, also raising 4 grandkids, raised her hand to share her story with us but apologized for not standing. She suffers from a lot of back pain, she explained. 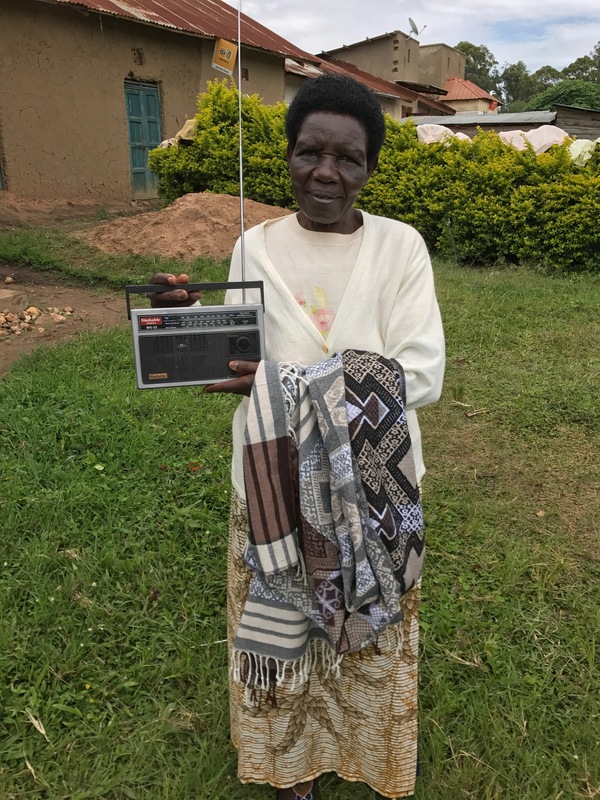 Jolly was a pioneer — the first of the 7000 or so NAF grannies ever to be deemed by her group to be worthy of a one-million-shilling loan (a whopping $275). She got the money in January and used part of it to buy a foot-powered sewing machine. 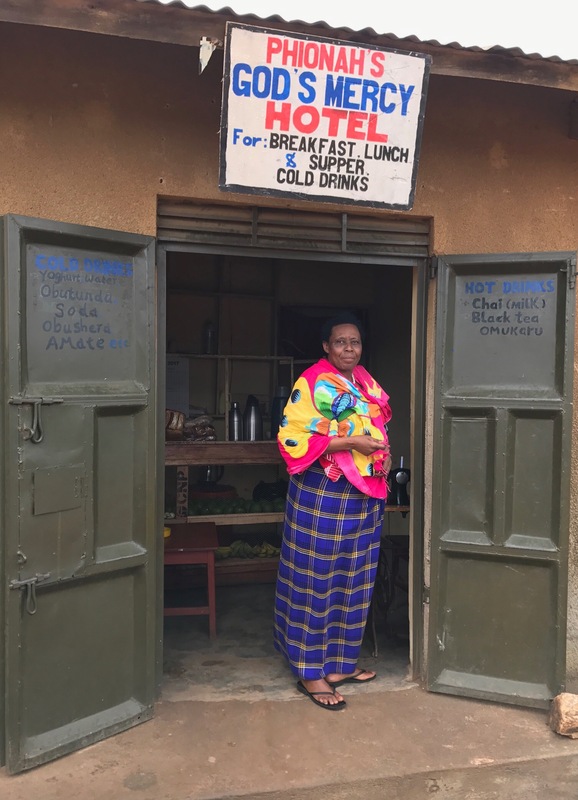 With the rest, she was renting a little storefront in the center of her town (Buyanja) — $22 a month for a 6-month term. Tailoring wasn’t something new for her. 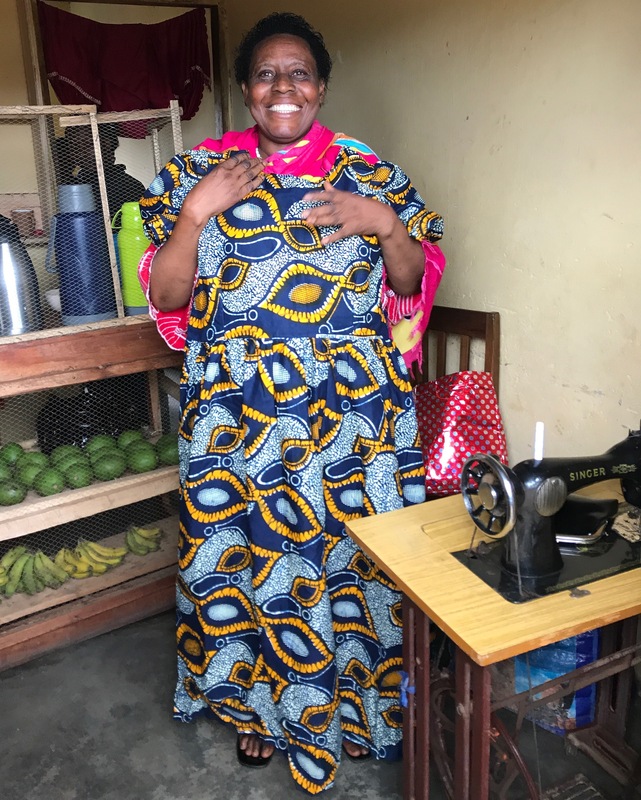 She had learned to do it more than 30 years ago, and at one time had owned 8 sewing machines and employed a crew of girls to make clothes that she sold in the market. But her husband had died in 1994, and she had had to sell all her machines to support her 5 children. Although Buyanja had other tailors, Jolly had also created a tiny retail counter and a tea shop in the back of her space. A couple of customers were in it when we visited. Jolly’s tailoring and tea shop. Phionah is the name of one of her daughers, who helps out. And people call all sorts of businesses “hotels.” Don’t ask me why. Jolly showed us one of her recent creation. Most of the granny loans are nowhere near the size of Jolly’s. Mauda, 72 and providing a home for three grandchildren, had recently borrowed 50,000 shillings (just under $14). She used the money to buy 2 hens, and she had allowed most of the eggs they laid to hatch. Now she has 12 hens, and besides looking forward to a handsome profit from selling some, she was also using their droppings to fertilize her garden. Although her loan was only a 20th the size of Jolly’s, she looked just as proud of what the money was helping her to achieve. Along with these common tales, I learned one thing after another that surprised me. One woman stood up and testified as to how grannies used to be despised in their villages, considered worthless because of their “boozing” and general lack of value. With the formation of her granny group, she and her comrades had acquired self-respect and hope; their status in the community had soared. Steve later asked one of the team members if this woman had been joking; the vision of drunken grannies seemed comic. But the NAF team members assured him she’d been serious; overwhelmed by the difficulty of their situation, the women often had succumbed to alcoholism and despair. I was surprised to hear how much the grannies worry about theft, even though in many ways, the rural communities are safe and honest places. When a small backpack belonging to our driver fell out of the van, unnoticed, a villager retrieved it, asked around for the phone number of one of the Nyaka team members, called, and carried the pack to us. But grannies also talked of having to defend against thugs who might steal their chickens, their crops, and their kitchen items. We asked if they used watchdogs. But dogs cost money to keep, and persistent thieves don’t shrink from poisoning them. Not only the grannies told us things that astounded us. One day during lunch at a simple roadside joint, the topic of malaria came up. The Ugandans who work for the foundation are smart, well-educated, sophisticated. But every one of them was infected with malaria. Everyone is, they said. We pressed them, and they told us how they dealt with flare-ups. They shrugged it off, but it sounded a lot more painful than the common cold. Ronald, our driver, was similarly matter of fact when we asked about his background. His father had been a doctor, but he had died when Ronald was 6 months old. Then his mother died a year and a half later. Rather than care for 2-year-old Ronald and his 8-year-old sister, the villagers treated them like pariahs (“ghosts” is the term Ronald used). If their parents had been cursed, the children were likely to be cursed also. So Ronald’s sister had somehow raised him. How does an 8-year-old do that? How did Ronald grow up, save money for driving school, and turn himself into the steady, sharp, and competent driver he is today? On our final drive from Kampala to Entebbe to catch our flight Dubai Monday morning, gazing out the window of our taxi, I saw hundreds of reminders of how hard life is here: guys hawking packs of toilet paper to folks stuck in the hellish traffic, women carrying heavy loads of eggplants and other vegetables on their heads, a kid scrambling to drag in the furniture displayed on the lawn outside a shop before the rain got too heavy. So much more. But with all the evidence of struggle and suffering, there’s so much heroism — stories like Ronald’s of mind-boggling perseverance. You don’t have to dig very deep to find it. The contrast between the sun-scorched Arabian peninsula — all grays, tans, and black — and lush central Uganda is stark. “It’s like another planet,” Steve murmured, looking out on our descent toward the riotous shades of green, fertile red earth, and red rooftops. One of the rainy seasons here in “the pearl of Africa” is March to June, and during that period, temperatures are mild. Although Entebbe is almost on the equator, its elevation is around 4000 feet. When we arrived Sunday afternoon it was in the mid-70s and the sun was shining through scattered clouds. So many birds were singing they made me think of noisy party-goers. Steve and I rarely return to countries we’ve already visited. We’re curious about so many places we haven’t yet gotten to (India! Turkey! Mongolia! ), it feels like there isn’t time to go back anywhere. Yet we’ve come back to Uganda because our mission here isn’t tourism but microfinance. When we were here four years ago, we visited a village in the southwestern part of the country to learn about a Ugandan project seeking to partner with Women’s Empowerment (WE), the San Diego organization started by friends of ours more than 13 years ago. We returned from that trip impressed with the Ugandan operation, a partnership resulted, and since then Steve and I have served as liaisons between the folks in San Diego and those in Uganda. WE has raised more than $100,000 for the Uganda organization, which lends that money to groups of women between the ages of 50 and 100 who are raising their orphaned grandchildren. Individual grannies in the groups borrow small amounts of money (typically $15 to $80) for four-month periods and use it to buy rabbits or pigs or other animals, craft materials, or items they can resell at a profit. Two representatives from San Diego visited two years ago to assess the microloan program up close, and now we’re here to follow up. Because May 1 is a holiday in Uganda (as in many countries), we had Monday free. 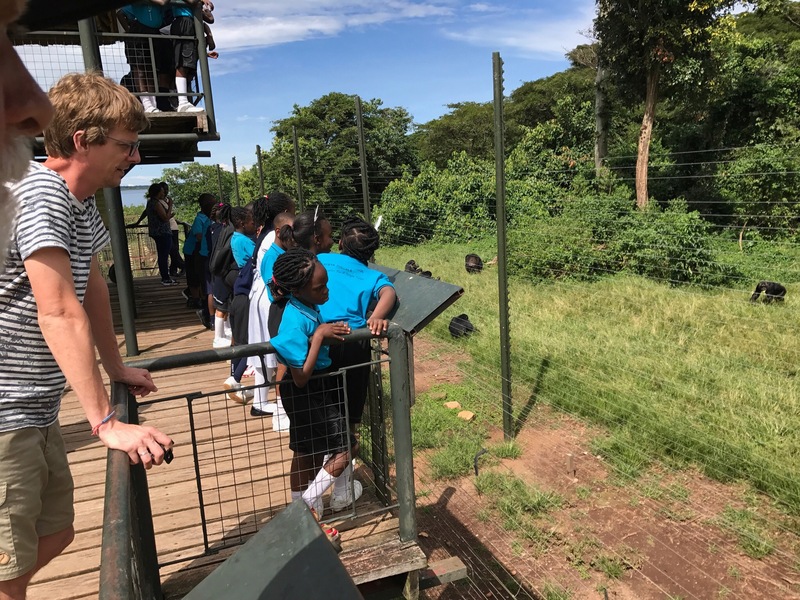 This suited us fine because we also wanted to visit the chimpanzee sanctuary on Ngambe Island, located in Lake Victoria, which adjoins Entebbe. I was vaguely aware of the sanctuary four years ago, but there was no time to squeeze in a visit. Since then, however, both Steve and I have read The Bonobo Handshake, a book about primate research set in part on the island. That amped up my desire to see the Ugandan refuge. Months ago, I contacted the sanctuary and made a reservation for us to hire a speedboat that would take us out for a day trip. I awoke long before dawn on Monday to the rumbling of thunder. 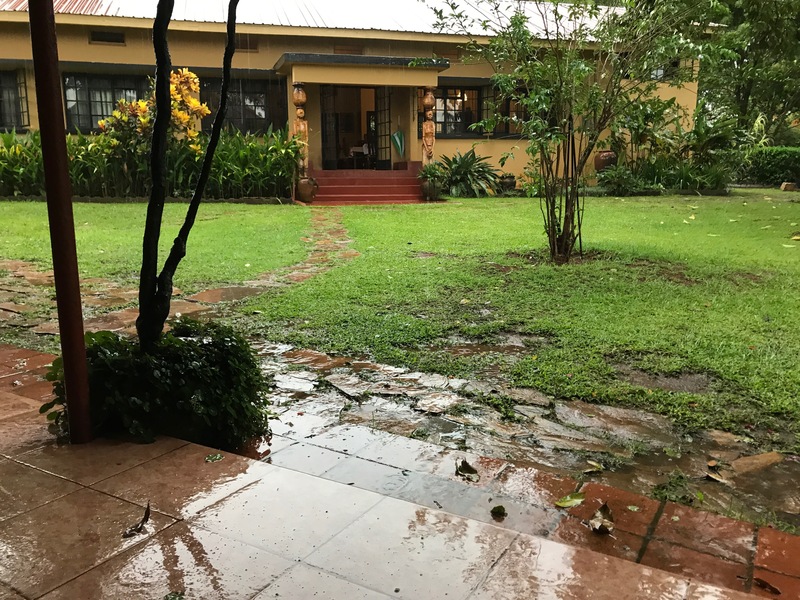 Uganda, like other parts of East Africa, has been suffering from a crippling drought, so it is happy news that in the last week, heavy rains have fallen. I have to confess, however, that when the pattering on our roof began early Monday, selfish thoughts assailed me. Soon the pattering turned into a downpour so violent it woke Steve. The pace of the thunder picked up, and I had to voice my concern: was it safe to venture out on a huge lake in a small boat during a thunderstorm? At breakfast in the guesthouse dining room, I asked the assistant manager what he thought. Steady rain was still pounding down, but the thunder had abated, and he assured us the speedboat would certainly have some kind of canopy. 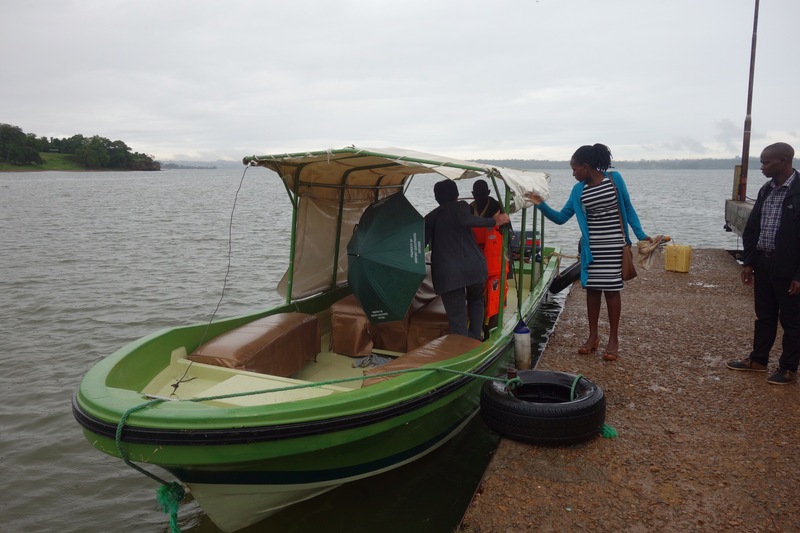 The guesthouse workers offered to give us a ride down to the boat dock, so we decided to assess the situation there. At first the facility seemed to be deserted, but then a guy appeared, a member of the boat crew, looking a little surprised to see us. (Although I’d reconfirmed our reservation a few days before our departure from San Diego, we hadn’t yet paid anything for the trip.) He said he’d have to go get some gasoline, but we should hang out under the overhangs, and we would depart soon enough. We strolled around, spotted the speedboat, and came upon another fellow who identified himself as one of the sanctuary cooks. He would be returning to the island after his block of time off. As we chatted with him, both the color of the sky and the intensity of the rain began to lighten, along with my spirits. I started to think the outing might not end in disaster after all. And it didn’t. We shoved off just after 10 (instead of the scheduled 9 am departure). By then, it was only drizzling and the boat’s canopy protected us. I still might have risked hypothermia as the twin 115 Yamaha outboards revved up and we jounced and hydroplaned over the dark gray water. 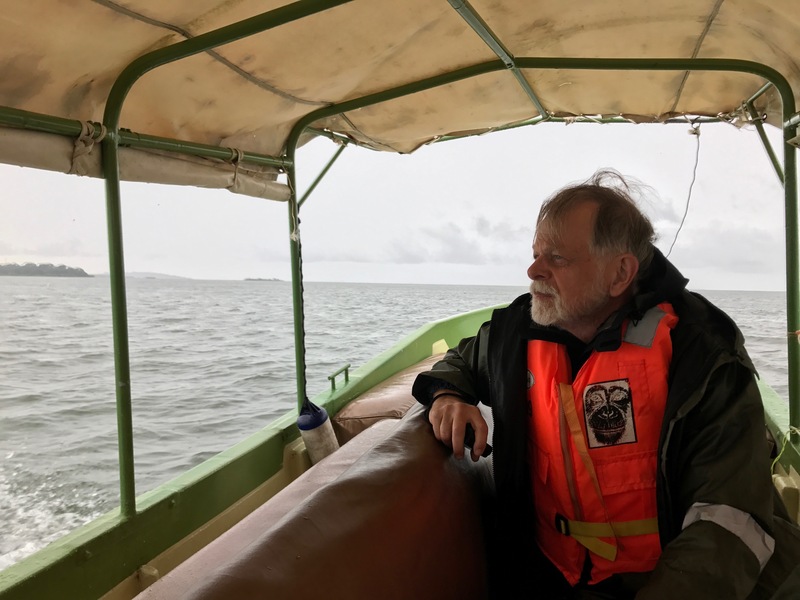 But the crew handed us heavy waterproof jackets and pants that kept us toasty and made me feel thrilled, rather than miserable, to be blasting in the direction of Tanzania at the start of a stormy day. Our time on the island was pure fun from start to finish. The rain stopped, and we had to strip off the protective gear. 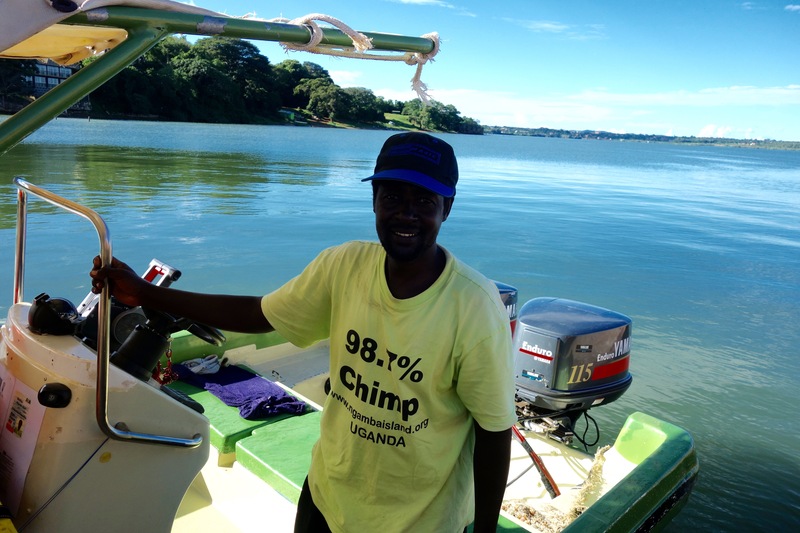 Paul, the Ugandan chimp caretaker assigned to show us around, had been working on the island for 11 years; his knowledge of the sanctuary and its inhabitants was near-encyclopedic. The place is remarkable. 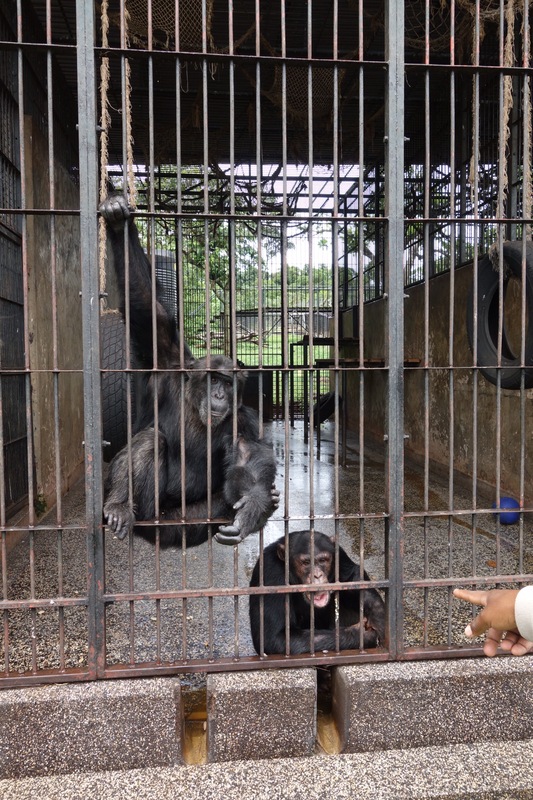 Purchased 20 years ago by Jane Goodall and other chimpanzee fans, the island is a home for chimps who’ve been rescued from a variety of grim fates (poacher traps, war zones, pet traders). They get to hang out and play in about 95 of the island’s total 100 acres during the day, but at night they’re lured (by their evening feeding) into a giant cage-like structure where they sleep in hammocks. They can’t just live independently in the forest because it’s only big enough to sustain 2 or 3 animals, whereas the community has grown over the years to include 49. 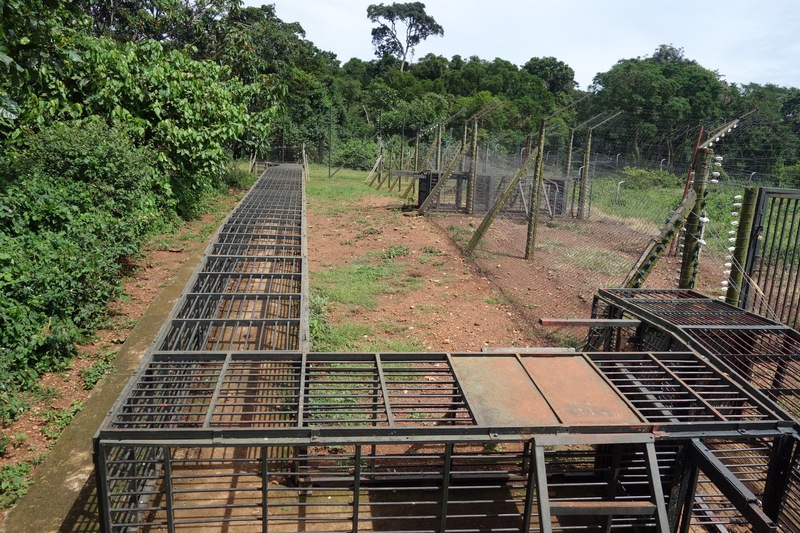 During the day, electrified fences keep them from breaking into the 5 acres occupied by the caretaker quarters, small veterinary clinic, and other facilities for the humans. Since chimpanzees can’t swim, the lake water prevents most of them from making a watery escape, although Paul did tell us how one of the apes somehow managed to highjack a local fisherman’s boat — stocked with fish. That guy floated off for some time before the humans somehow recaptured the craft. Even more astounding was the story about the night a new worker forgot to padlock the animals’ sleeping quarters. The chimps noticed this in short order, broke out and began a wild rampage that had them marauding into the staff dining room. The humans all fled into the water to avoid being injured or killed. 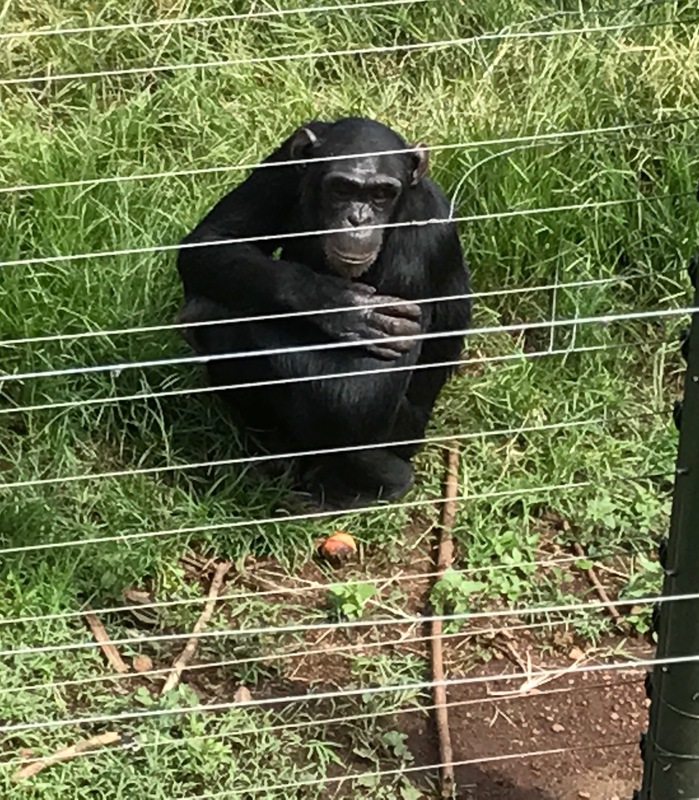 It only ended when a chimp named Megan got into the kitchen, found the stash of beer and wine, and alerted her fellows, who somehow got the bottles open and drank all the contents. Once drunk, they grew drowsy enough to enable their recapture. 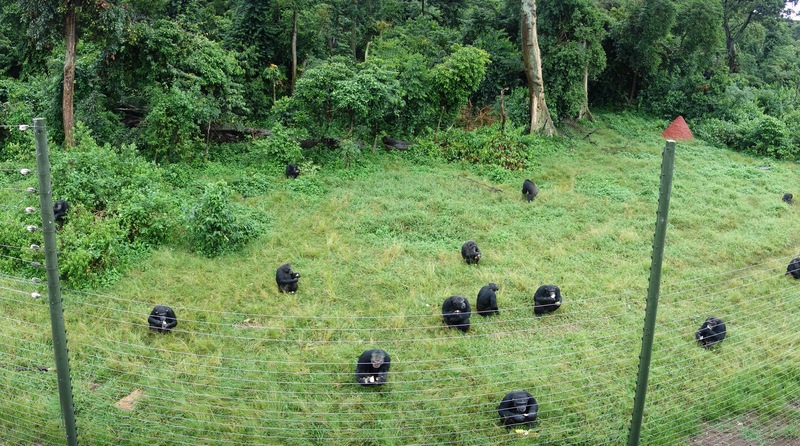 Twice during the day we got a glimpse into why you’d want to keep a fence between you and the chimps at all times. They’re fed four times daily, and we got to watch the 11 am and 2:30 pm feedings. We positioned ourselves on an elevated platform. As a worker approached with pails filled with fruit, resounding hoots issued form the forest, and soon the animals began appearing and positioning themselves along the fence. We might have been 20 or 30 feet from the closest ones. That felt close, certainly close enough to feel their size and power, close enough to read their facial expressions. Some raised an arm or clapped their hands or stamped their feet, demanding that oranges and carrots and avocado and chunks of jackfruit be lobbed in their direction. (They made me think of New Yorkers hailing cabs.) Savage fights with lots of howling and blood-curdling screams and teeth-baring and breakneck chases broke out several times during each feeding session. Then they ate all the food and disappeared into the jungle again. 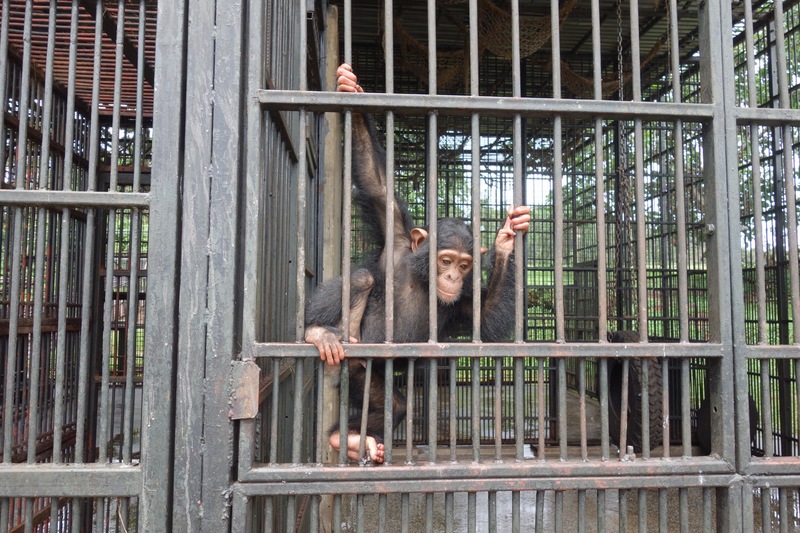 They’re not as charming and lovable as the bonobo colony in our zoo in San Diego. But motoring home in the late afternoon over the glassy sun-dappled lake, I’ve never been happier that a little rain failed to stop us from enjoying the adventure.